Jewelry Label Printer will not charge your credit card until your orde	Jewelry Label Printer will not charge your credit card until your order is shipped. Please call Jewelry Label Printer at 203-588-2500 (M-F), between 8:00am - 5:00pm Pacific Time, for a return authorization of DYMO LabelWriter 450 Turbo Printers and DYMO LabelWriter 450 Twin Turbo Printers. Return DYMO LabelWriter 450 Turbo Printers and DYMO LabelWriter 450 Twin Turbo Printers for any reason within 30 days from date shipped. 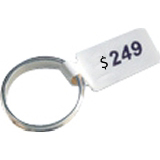 Jewelry Label Printer will gladly exchange it or give you a full refund (less shipping) whichever you prefer. Jewelry Label Printer is not responsible for return shipping or charges. Defective DYMO LabelWriter 450 Turbo Printers and DYMO LabelWriter 450 Twin Turbo Printers may be returned for replacement to Jewelry Label Printer only within 30 days. After 30 days, the defective DYMO LabelWriter 450 Turbo Printers and DYMO LabelWriter 450 Twin Turbo Printers can be repaired or replaced by the manufacturers of the DYMO LabelWriter 450 Turbo Printers and DYMO LabelWriter 450 Twin Turbo Printers within the warranty period of the DYMO LabelWriter 450 Turbo Printers and DYMO LabelWriter 450 Twin Turbo Printers. Returns of DYMO LabelWriter 450 Turbo Printers and DYMO LabelWriter 450 Twin Turbo Printers must have copy of sales receipt, all packaging, parts, accessories, warranty cards, instructions, etc. 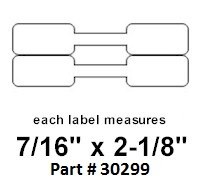 The merchandise and packaging must be in new condition without any tape added to the original merchandise container. Returns of DYMO LabelWriter 450 Turbo Printers and DYMO LabelWriter 450 Twin Turbo Printers must be packed inside a shipping box. 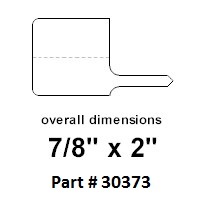 If these guidelines are not met merchandise may be refused, shipped back to the customer or a restocking fee. 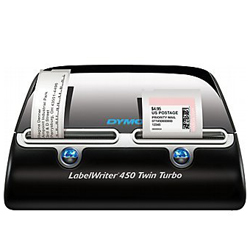 Please note that "Free Shipping" of DYMO LabelWriter 450 Turbo Printers and DYMO LabelWriter 450 Twin Turbo Printers only applies to US residents living in the lower 48 States. All Canadian customer’s DYMO LabelWriter 450 Turbo Printers and DYMO LabelWriter 450 Twin Turbo Printers orders are shipped EMS Global Express Mail or USPS Priority International Mail. Defective DYMO LabelWriter 450 Turbo Printers and DYMO LabelWriter 450 Twin Turbo Printers may be returned for replacement only within 30 days. Customer is responsible for the shipping charges of DYMO LabelWriter 450 Turbo Printers and DYMO LabelWriter 450 Twin Turbo Printers. After 30 days, the defective DYMO LabelWriter 450 Turbo Printers and DYMO LabelWriter 450 Twin Turbo Printers can be repaired or replaced by the manufacturers of the item within the warranty period of the DYMO LabelWriter 450 Turbo Printers and DYMO LabelWriter 450 Twin Turbo Printers. 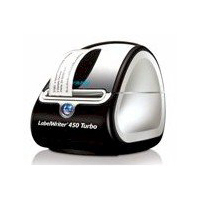 Shipping charges of DYMO LabelWriter 450 Turbo Printers and DYMO LabelWriter 450 Twin Turbo Printers are non-refundable. 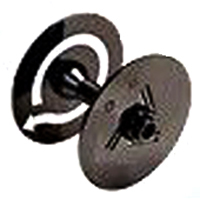 Shipping costs DO NOT INCLUDE DUTIES AND CUSTOMS FEES, these are the customer’s responsibility.